Noah Fralich, owner of Norumbega Cidery, pops open his flagship beverage, Classic Hard Cider. You can sample his entire collection at a free hard cider tasting and barbecue at Norumbega Cidery, 380 Woodman Road, New Gloucester, from noon-5 p.m., Saturday, Aug. 13. Visit Norumbega Cidery, one of southern Maine’s newest hard cider businesses. See firsthand how hard cider is made, where it is bottled, and learn about the particular apple varieties used to make this traditional beverage. The Norumbega Cidery will be open from noon to 5 p.m. on Saturday, Aug. 13. Sample all of Norumbega hard ciders – classic, honey or berry – plus test and pick your favorite from this year’s special batches. Also, enjoy barbecue and lawn games while you sip. They’ll have bottles for sale to take home with you, too. 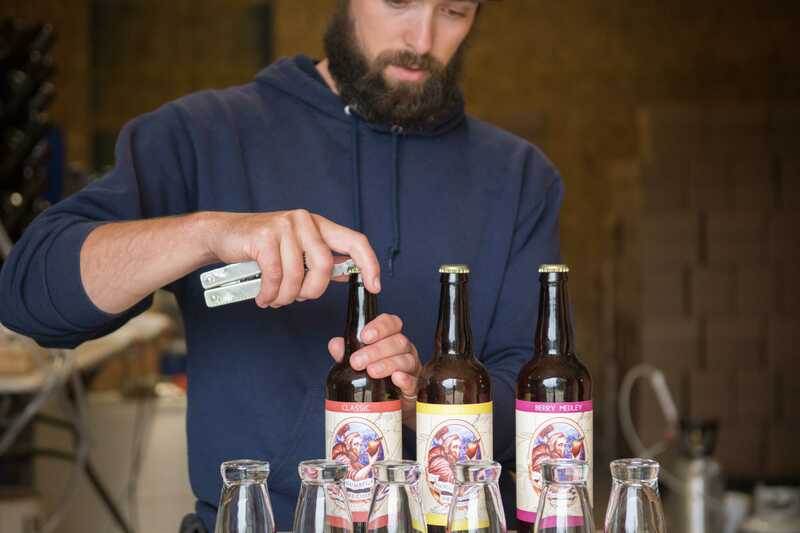 Hard cider played a strong part in the history and traditions of rural Maine and is making a comeback as an option for those interested in locally brewed and produced beverages. The Norumbega Cidery, located at 380 Woodman Road, New Gloucester, is operated by Noah Fralich. For more information, see www.norumbegacidery.com or Norumbega Cidery on Facebook. This entry was posted in Events, News, Other and tagged community, food, History Barn, local organizations, Pineland Farms, Shaker Village. Bookmark the permalink.